The House of Delight01621 854 854work RestaurantIf you are looking for delicious Chinese food and a great night out, then book a table at the House of Delight. We are a family run Chinese restaurant, specialising in preparing Cantonese and Peking cuisine from quality fresh ingredients. Established in Maldon in 1970, we have been serving our customers with this delectable cuisine for over 40 years. If you are looking for delicious Chinese food and a great night out, then book a table at the House of Delight. We are a family run Chinese restaurant, specialising in preparing Cantonese and Peking cuisine from quality fresh ingredients. Established in Maldon in 1970, we have been serving our customers with this delectable cuisine for over 40 years. 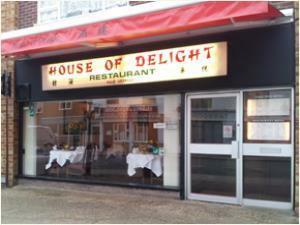 The House of Delight is a well known restaurant in Essex, providing a Chinese takeaway service. We also have another Chinese restaurant in the Chelmsford area, called Lantern House, offering the same level of quality Chinese food in the restaurant and to takeaway.